Who buys Purpose Built Student Accommodation (PBSA) ? In recent years, the typical buyers of Student Property have changed from being multi-million pound purchasers such as property developers and financial institutions (mostly pension funds and overseas investment banks) to a mix of the same institutions, property speculators, buy to let portfolio managers and private individuals looking for safe ways to obtain better income returns on their savings. The main reason for this shift in investor types is that developers have realised the benefits of selling individual units in their Student Property developments as buy to let investments, as opposed to selling the whole property to a single (very rich) buyer or alliance of financial institutions. Indeed, in the last five years the purchase of (and investment in) PBSA – Purpose Built Student Accommodation – has become the main “alternative asset class” in the UK and is rapidly becoming a mainstream investment option for the millions of British individuals who are unhappy with the interest they are receiving on their savings from banks, building societies and income bonds. accounts, looks like continuing to do the same”. In 2015 there were only 29,000 new beds in purpose built student accommodation developments for Britain´s 1.7 million students. Such is the promise for PBSA investments long term that of the £9 Billion invested in UK PBSA over the last two years, over 80% of the purchases were made with overseas capital: property investors (mostly financial institutions) who are rapidly expanding their portfolios, post Brexit concerns not even being a quiet murmur. There are already a total of over £1Billion in queued investments for 2017, meaning another impressive year for the market is already assured. Recent budgetary changes and increased regulation in lending to private landlords have made traditional buy-to-let investing less attractive, giving PBSA even more weight as an alternative to be considered. It has been consistently demonstrated that, given the choice, students prefer PBSA over HMO stock and are willing to pay much more rent than for HMO. Most interestingly, the biggest growth by investor type has been the private individual investor, who whilst still only accountable for some 2% of the total capital invested in the sector fall in the majority into two categories: the experienced buy-to-let portfolio landlord, who has experienced the headaches associated with traditional property letting and the private individual, who has been advised by their financial adviser or other such professional to consider PBSA, as a way to vastly improve upon the meagre returns they are receiving on funds sitting in savings accounts. The average price per bed space has fallen in the last year from an estimated £99,750 to £73,450, making student property investments ever more accessible to private individuals. A single unit (say a Studio Apartment) in a PBSA development can now be had for under £50,000 (see here) with a guaranteed yield of 9% net pa and none of the usual problems associated with being a landlord, which is seen as an increasingly attractive proposition for the would be landlord. 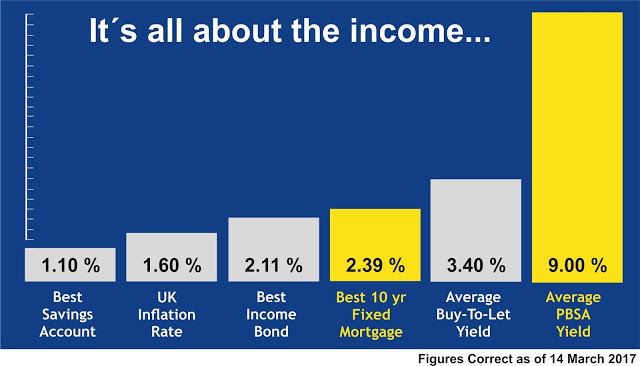 And it is not just the typical buy-to-let landlord or individual with a healthy bank balance that is investing in PBSA. In several instances sales agents are reporting that their clients are leveraging their most under-used assets – the value of their own homes – to bolster their income (i.e. 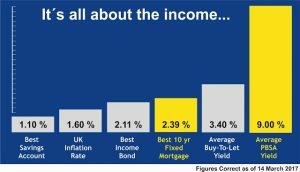 taking out a low fixed interest rate re-mortgage and then using the funds to invest in PBSA with guaranteed fixed high interest returns and pocketing the difference). As total returns in the student accommodation sector have consistently outperformed all other traditional asset classes, perhaps this type of investment will become an ever more widely recommended strategy by mainstream, personal Independent Financial Advisers in the UK?